Powerful and well-organized kingdoms are beginning to emerge in Korea. Korea is covered by many warlike tribal kingdoms. 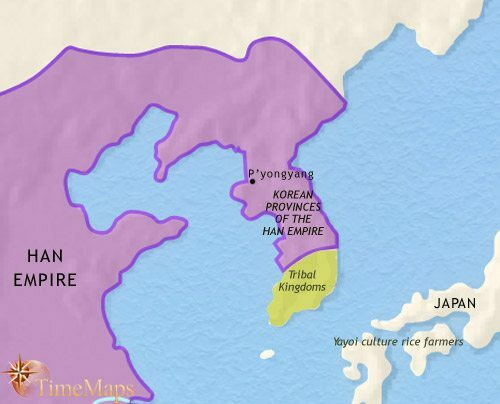 Northern Korea is occupied by the Han empire. 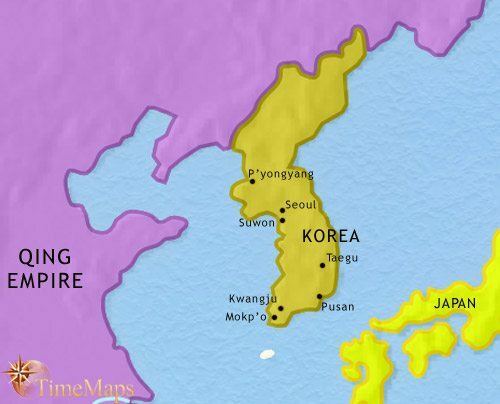 The kingdom of Silla has united most of the Korean peninsula under its rule. The Koryo dynasty has now united all Korea under its rule. A military government now rules Korea. Movable type printing is invented in Korea. Korea is the first country in the world to build iron warships. 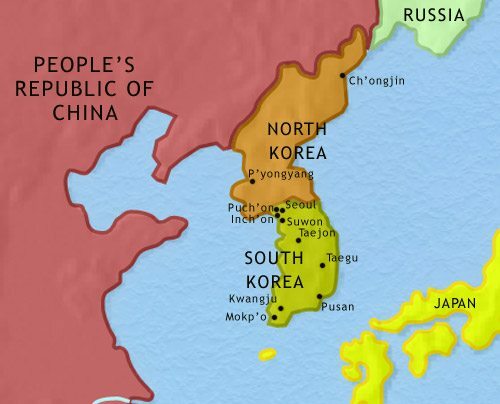 Korea is a tributary state of the Chinese empire. Korea remains a tributary state of the Chinese empire. Korea remains secluded from the outside world. Korea is now under Japanese rule. 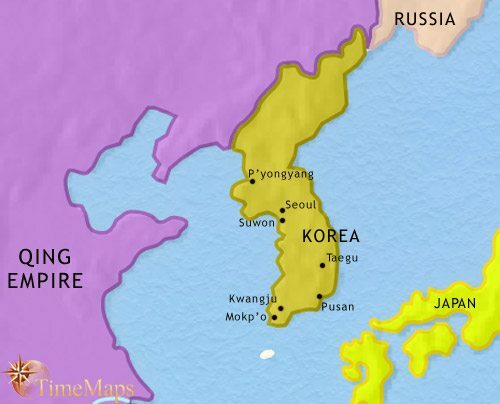 Korea is now divided into North and South Korea. Korea is divided between one of the richest and one of the poorest countries in the world. The continual wars between the Korean kingdoms made Korea a land of forts, walled cities, and warlike elites. Korean society at this time seems to have been an intriguing mix of spectacular barbarism and increasingly advanced civilization. It was during this period that the tribal kingdoms, hitherto comparatively loose confederations of clans, transformed themselves into centrally-organized kingdoms, the three leading ones being Koguryo, Paechke and Silla. They have bureaucracies, standing armies and large capital cities modelled on Chinese lines. The ruling classes of the various kingdoms have adopted Chinese civilization wholesale, and both Confucianism and Buddhism have come into the peninsula from China during these centuries and established their influence at the highest levels of society. Iron working was introduced into the Korean peninsula in the 4th century BCE. At around the same time, the first historically-known kingdom arose in the region, in the north. This was Gojoseon, and it appears in contemporary Chinese records as a trading partner and military opponent of states in northern China. 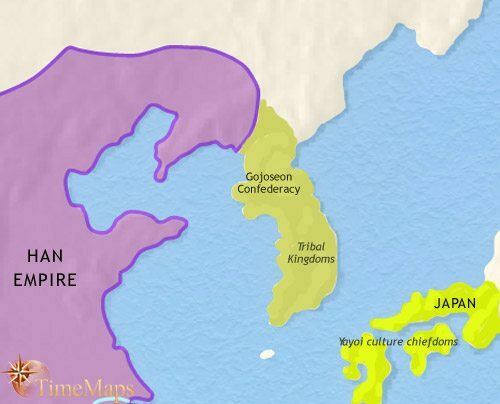 In fact, Gojoseon was probably only one of a number of tribal kingdoms that arose in the peninsula at this time. These states were centred on small walled towns, and were probably confederacies of smaller chiefdoms under the leadership of a powerful leader, or king. 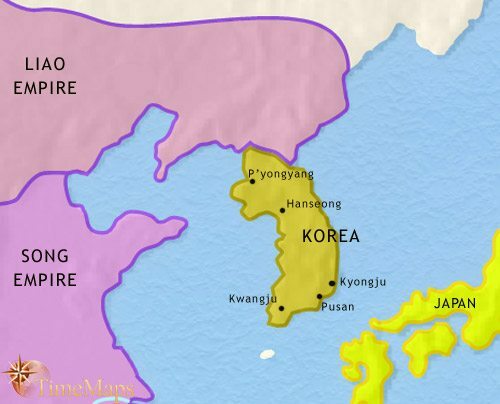 Gojoseon expanded into a league of such kingdoms (it is referred to as a “confederated state” by the Chinese) covering a large area of northern Korea. All this was linked to the coming of horses and chariots to Korea, and the more organized warfare that this necessitated. Iron weapons also made their appearance. With the union of China under the Han, Chinese cultural influences have greatly increased in Korea, stimulating trade, especially in new luxury products. This was especially true after 108 BCE, when Han armies occupied the northern part of Korea and founded four provinces there. Within these provinces, the upper classes rapidly adopted all the accoutrements of Chinese civilization. Beyond the borders of the Han empire, the old tribal confederacies begin to make way to more centrally organized kingdoms. 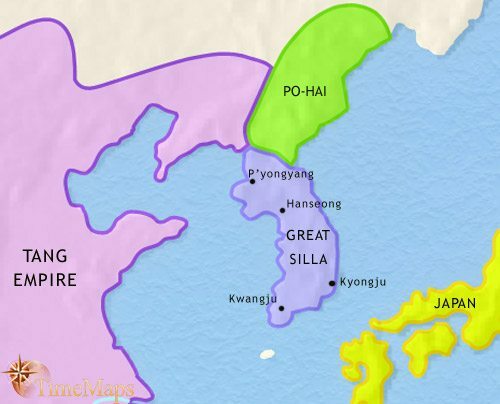 At its height, the Han empire of China ruled much of Korea, and established colonies there. 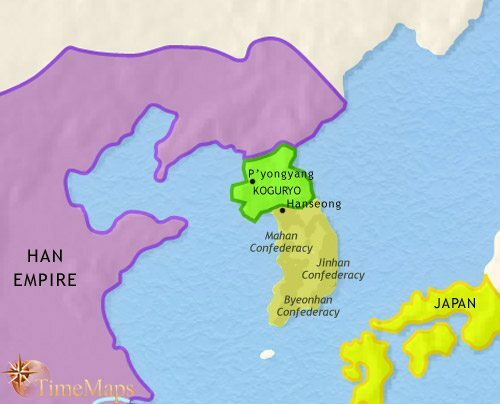 However, the Chinese have now been driven from the Peninsula, and a Korean kingdom has emerged in the north, Koguryo. This is a well-organized military state which is able to take large Chinese armies on equal terms. 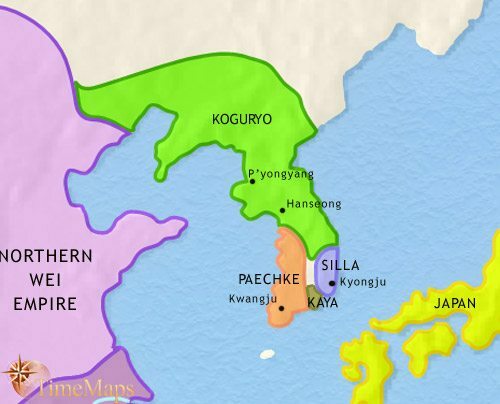 In the southern part of the Peninsula, the small tribal kingdoms are gradually coalescing around certain powerful rulers, and the future kingdoms of Silla and Paekje trace their origins back to this period. The whole Korean peninsula has now come under the control of Silla. This state, armed with a powerful military system and allied with the Tang empire, first defeated its two rivals (in 660 and 668) and then drove out the Tang from the peninsula. Silla has become a bureaucratic state under an absolute monarch, modelled on that of the Tang. The aristocracy has lost much of its power, though its members staff the senior posts of the civil service. Buddhism is the state religion, but prospective officials are given a Confucian education. The Silla capital of Kyongju has become a city full of Buddhist temples and royal palaces. After Koguryo’s conquest by Silla, a group of refugee Koguryo nobles established a new state called Po-Hai. This state considers itself to be a continuation of Koguryo. Contemporary records describe it as prosperous and highly civilized. Political instability in the Silla court resulted in a weakening of the central government’s control over the provinces. Local lords exercised an increasing amount of power, and law and order broke down. Finally, provincial rebellions briefly divided the state of Silla into three parts. The Korean peninsula has been reunited under Wang Kon (936), the founder of the dynasty of Koryo. Koryo is a feudal state, with a large measure of power in the hands of local lords. These form an elaborately graded aristocracy, the senior members of whom hold the most senior posts within the bureaucracy and make up the Supreme Council. Koryo, like its predecessors, is a Buddhist state, though Confucianism is used as a governing ideology and forms the basis for the education of officials. As befits a Confucian system of government, military officers have a lower status than their civilian colleagues. The unified Korean state of Koryo enjoyed a long period of stability, ruled by a king with the support of a powerful aristocracy. The low status of military commanders, however, eventually boiled over in a mutiny in 1170. A large number of officials were massacred and military leaders seized control of the state. The country became a military dictatorship, with the king a mere figurehead. The military government suppressed Buddhism, which was driven underground, but improved the conditions of the peasants. In 1224 movable type printing is invented in Korea. This important development is an illustration of the precocious inventiveness that Korean civilization has shown throughout its history. 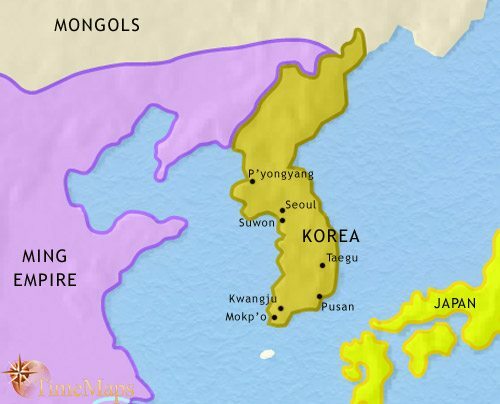 Korea fell under Mongol overlordship after a prolonged struggle starting in the 1230’s. Externally, the Koryo kings were now vassals of the huge Mongol empire; internally, they were increasingly powerless. The estate-owning aristocrats extended their holdings at the expense of the peasantry, unchecked by the government (which was in the hands of the same aristocrats). This reduced tax revenues, which had mostly come from the free peasantry and, also, the pool of potential recruits for the army, also traditionally recruited from this class. With the ejection of the Mongols from China in 1368, Korea also regained its independence. In 1392, a group of junior Confucian scholar-officials, supported by the army commander Yi Song-gye, seize control of the government. The Koryo dynasty was dethroned and Yi was installed as the founder of the new Choson dynasty. The new regime established Confucianism as the state ideology. The aristocracy retained its importance as the recruiting-ground for the bureaucracy; indeed public service is the only profession open to its members. Korea continued to flourish under the Choson dynasty. It became an increasingly centralized state, with all officials directly appointed by the central government. However, in the late 16th century the country was shattered by two great Japanese invasions of 1592-3 and 1597-8. One notable incident in these wars, again showing Korean inventiveness, is the first appearance in history of iron warships. Further invasions, this time from the Manchu, added to Korea’s misfortunes. However, with the Manchu invasion of China and the establishment of their Qing dynasty, Korea again experiences stability, as a tributary state of China. The country sets about rebuilding its economy. Korea is a tributary state of the Chinese empire; however, in terms of self-government, the country is entirely independent. 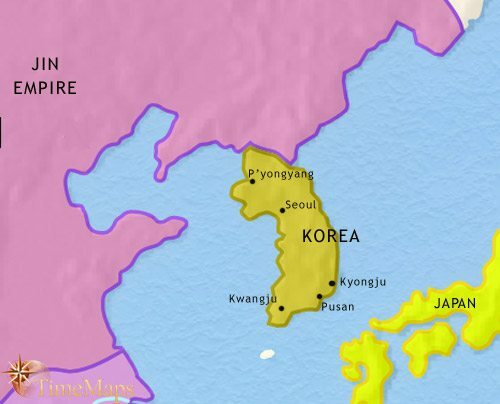 With peace, the Koreans have made a good economic recovery from the invasions of the late 16th and early 17th centuries. Advances in farming and new crops raise the living standards of the peasants and stimulate trade. The cash economy expands and consumer goods become more common. Korean scholarship also continues to develop in many fields, and in the arts, works aimed at a broad, popular market – novels, operas, paintings of ordinary people doing everyday things – become common. Like other countries in Asia, Korea is having to respond to western influences, above all Christianity. Catholic missionaries make converts in all sections of society. Korea remains a tributary state of the Chinese empire. Its contact with westerners remains restricted, but the Catholic church continues to expand, despite some persecution. Korea has succeeded in keeping westerners at arms length more successfully than either China or Japan. Internally, however, the country has been experiencing instability. A succession of child kings have led to factionalism at court, which in turn has weakened provincial government and allowed corruption and oppression to spread. Popular unrest has become widespread, and in the 1860’s, many Korean peasants, harshly oppressed, turn to a new religion, Tonghak, which combines elements from various other religions and whose aim is to establish a truly just society on Earth. In 1864, the Regent Yi Ha-ung starts to introduce some much-needed reforms in the administration, and tries to suppress factionalism. He also seeks to follow a policy of seclusion from the west, rebuffing western overtures for trade treaties. There is a massacre of Catholic converts, which leads to a brief French invasion (1866). However, even at this date, Korea remains largely secluded from the westernising forces swirling round the Far East. From 1873, a new regime opens Korea’s doors to the outside world, letting first Japan, then China, in, and then others. A haphazard modernizing programme is inaugurated, funded largely by Chinese and Japanese investment; it is undermined however by continuing political instability at court. 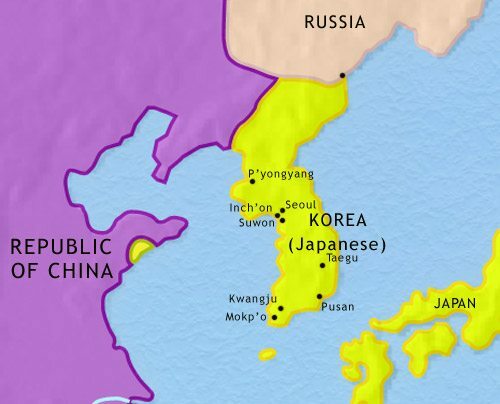 In order to protect their investments, Japan and China agree that Korea should be a joint sphere of influence (1885). Increasing peasant unrest provokes both powers to send in their troops, which sparks off the Sino-Japanese war of 1894-5. Japan wins this war, and Korea is assigned to the Japanese sphere of influence. This interferes with Russia’s ambitions in the region, and leads to the Russo-Japanese war of 1904-5. Japan is again victorious, and Japan’s position in Korea is secured. Korea becomes, first, a Japanese protectorate and then, in 1910, a Japanese colony. Koreans endure three and a half decades of Japanese occupation, characterized, towards the end, by a determined attempt to obliterate Korean culture. In 1945, Korea is liberated, by Soviet troops north of the 38th Parallel, and by US troops south of it. 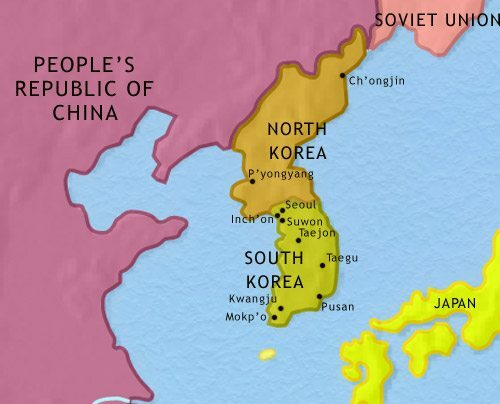 The Soviets set up a communist government under Kim Il-sung in the north. In the south, after some delay, the USA sponsors the setting up of a republic which, in 1948, is recognized as the only official government of Korea by the UN. At the same time, the North Korean government is recognized as the only lawful government in Korea by the USSR. Events swiftly lead to the Korean War of 1950-53. South Korea is devastated by the war, but her economy is rebuilt with international (mostly US) aid and investment. Under the autocratic rule of Syngman Rhee, the country goes on to build a prosperous, export-orientated economy. North Korea remains under the harsh rule of the USSR’s nominee, Kim Il-sung. In South Korea a coup in 1961 brought Park Chung-hee to power. He presided over continuing economic growth until his assassination in 1979. Growing civil unrest brought an end to dictatorship, and South Korea moved to becoming a fully functioning, multi-party democracy (1988). The country was caught up in the East Asian Financial Crisis of 1997, which dented South Korea’s economic progress somewhat, but even so, the country has become one of the world’s largest economies. North Korea is a harshly-ruled country with a rigidly planned, utterly failing economy. There have been bouts of famine in the 1990’s. In 2005 the world community has cause to be anxious about this country’s ambitions to become a nuclear power.